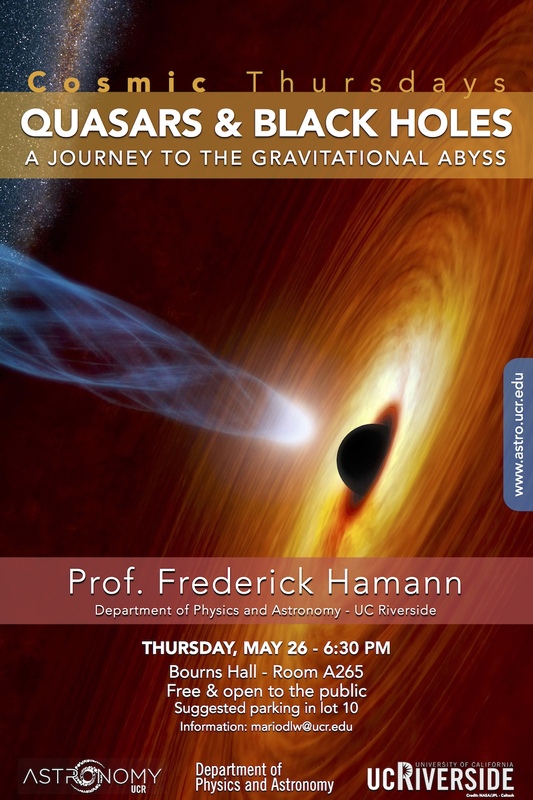 COSMIC THURSDAYS, a series of public and free talks on astronomy subjects continues during Spring 2016. The talks are designed with the general audience in mind, they are fun, easy to understand, and engaging. Black holes with masses of a million to a billion Suns reside in the centers of all galaxies, including our own Milky Way. We will explore the exotic realms of black holes, gravitational waves, and the distortions in space and time caused by strong gravity. We will also learn how these darkest objects in the universe were once lit up as quasars – brighter than whole galaxies full of stars. The talk will be held in the Bourns Hall Building Room A265 and lasts 45 to 60 minutes. Although parking is unfortunately not free, it is surely very cheap at $1.25 per hour [see details here]. We suggest guests use parking lot 10. The final talk will be by Prof. Gabriela Canalizo on June 9th.